Guelph, Ontario - Back by popular demand, Equine Guelph has announced the second offering of the Biosecurity Prevention eWorkshop from October 22 - November 4, 2012. 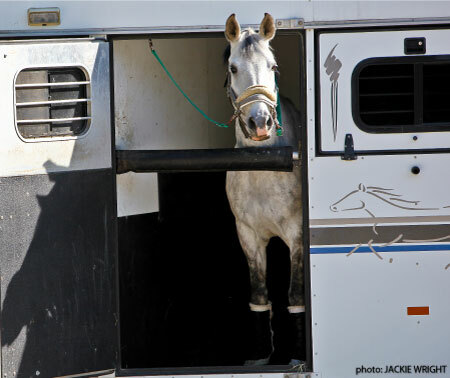 Equine Guelph's new eWorkshops are two-week online short courses designed for busy horse owners. They provide the latest evidence-based information available from University of Guelph and industry experts. Take a look at Equine Guelph's Report on Research video with University of Guelph's Dr. Scott Weese outlining practical points of what a horse owner can do to reduce the chances of his or her horse catching an infectious disease such as West Nile Virus. Dr. Weese, who also authors the "Worms and Germs" blog, says "Having a basic infection control plan in place is probably the biggest thing someone can do to reduce the risk of disease." Weese goes on to stress, "It does not matter what you do with your horse(s), or whether you have only one horse, or a herd of 100, as an owner you should have a general idea of the measures you are going to take in order to reduce the risk of infection." Weese has been working in the area of biosecurity and infection control for over 15 years, always looking for better ways to prevent and treat infectious diseases with a strong emphasis on prevention. He gives talks at Equine Guelph's new biosecurity workshops and two week eWorkshop. In fact, Weese was the first speaker at Equine Guelph's "Beat the Bugs" biosecurity workshops launched last April for horse enthusiasts around the globe. He says, "Equine Guelph's biosecurity programs are great for getting people thinking in a broader context when it comes to infection control and putting into practice the easy day-to-day steps which can reduce outbreaks of disease." 1. Identifying risks of infectious disease in the barn and creating a practical biosecurity plan. 2. Reducing risks of disease by having and using hand washing stations, clean footwear and rules for visitors. 3. Having protocols for isolating new and returning horses. Biosecurity is just as important on the road and when visiting other venues. Disease is easily spread through equipment sharing. The first eWorkshop was positively received: Patty Russen, New York, USA said, "This course offered extensive information on biosecurity. I believe it to be valuable, and even essential, for any barn owner or for any horse owner/boarder that wants to protect and give their horse the best and safest conditions possible." "Beat the Bugs" is an awareness campaign developed by Equine Guelph with the assistance of 13 industry partners: the American Association of Equine Practitioners Foundation, Colorado State University, the Central Ontario Standardbred Association, Grand River Agricultural Society, Horsemen's Benevolent and Protective Association, Ontario Association of Equine Practitioners, Ontario Equestrian Federation, Ontario Harness Horse Association, Ontario Horse Racing Industry Association, Ontario Veterinary College, Standardbred Canada, Vétoquinol Canada Inc. and Woodbine Entertainment Group. The program is funded through the Agricultural Biosecurity Program (ABP), part of the Best Practices Suite of programs under Growing Forward, a federal-provincial-territorial initiative. The Agricultural Adaptation Council assists in the delivery of several Growing Forward programs in Ontario. For more information about Equine Guelph's biosecurity programs and to view the Biosecurity Calculator please visit www.EquineGuelph.ca/biosecurity.php or contact Susan Raymond at Equine Guelph, slraymon@uoguelph.ca. Equine Guelph offers award-winning online education from one of the top universities in Canada - the University of Guelph. Students benefit from insights offered by leading industry experts from across North America. Equine Guelph's online program has attracted over 1,000 students from all around the world, including every province in Canada, the United States, France, United Arab Emirates, Korea, Egypt, Australia, Austria, Poland, Denmark, Norway, Italy, Israel, Columbia, India and South Africa. Equine Guelph is known worldwide as one of the most respected online equine learning communities. Don't miss out- on the next two-week eWorkshop October 22 - November 4, 2012. Cost is $75 + HST. Visit http://www.equineguelph.ca/biosecurity_esessions.php for course details.